So far, our ballistics gelatin testing project has covered 184 different factory loads split across today’s six most popular handgun calibers: 9mm, .45 ACP, .40 S&W, .380 ACP, .38 Special, and .357 Magnum. In seventh place (and a fairly distant seventh, according to our sales data) comes our next test caliber: 10mm Auto. Since it was first introduced in the early 1980s, the popularity of 10mm has fluctuated, never quite reaching mainstream status but also avoiding the realm of forgotten oddball cartridges known only to handloading enthusiasts. It may be a long way from cracking the top five, but 10mm is more popular today than ever before and we’ve had numerous requests to add this caliber to our gelatin tests. Our test of 10mm self-defense ammo included 11 loads. That may not seem like many, especially compared to the number of loads we included in our previous tests, but there simply aren’t as many hollow-point offerings available for 10mm as there are for more popular handgun calibers. One complaint often heard from 10mm fans is that many of today’s factory loads are significantly lighter or slower than the original loads developed by the cartridge’s inventors. This is due, in part, to a lack of advancement in 10mm bullet technology. Most 10mm expanding hollow-point factory loads utilize bullets that are actually designed for .40 S&W (a cartridge originally derived from “light” 10mm loads). When these bullets are pushed to “real” 10mm velocities, they often do not perform as intended. While newer and better bullets have been developed for the major semi-auto service calibers over the last few decades, ammo companies have devoted comparatively few R&D resources to designing bullets specifically intended to take advantage of 10mm’s capabilities. There are, however, exceptions to this trend, and we have included some of the hotter 10mm factory loads in our test as well as the tame ones. If you’re interested in all the gritty details of how we conducted these tests, you might want to take a look at the test protocols and procedures outlined in the article accompanying our first batch of ballistics gel testing from back in 2015. We followed all of the same procedures for the 10mm testing. The short version is that we fired five rounds of each load into a block of Clear Ballistics synthetic gelatin arranged in line with a second gel block to catch any bullets that penetrated beyond the first block. Each shot was fired from a distance of ten feet and we used a four-layer heavy fabric barrier to simulate clothing. The velocity of each load was measured with a chronograph. The purpose of ballistic gelatin testing is to determine how a bullet can be expected to behave when it enters soft tissue. Specifically, the gelatin will show how deep the bullet can penetrate, and how much it will expand. Wound ballistics researchers have determined that a penetration depth between 12 and 18 inches in properly calibrated gelatin is ideal in the context of handgun ammo for defense against violent human adversaries. This standard has been in use by FBI researchers since the late 1980s, and we’ve highlighted the desired range on our penetration graph in the chart below. The standards for ideal bullet expansion have not always been as clearly defined by researchers, but for service handgun calibers, it’s reasonable to expect bullets to consistently expand to at least 150% of their original diameter (.60” for 10mm loads). For our tests, we’ve used blocks of the synthetic Clear Ballistics gelatin rather than the organic-based 10% ordnance gelatin that the FBI standards were originally based on. Physical properties of the two mediums differ in some ways, but they typically provide similar results when testing for penetration and expansion characteristics of handgun ammo. The Clear Ballistics gel is far less labor intensive to work with and allows us to test many more loads than would be practical for us to do with the traditional ordnance gel. It’s worth noting that the test standards outlined above were developed with human targets in mind. For animals, the 150% expansion and the 12-18” penetration guidelines do not necessarily apply. 10mm has recently gained some popularity as a hunting cartridge for small to medium game, and it also comes up often in discussions about “wilderness defense” against bears, wild boar, or other potentially dangerous animals. Our goal for this project from day one has been to help consumers find suitable self-defense ammo for use against two-legged predators, so the hunting or wilderness context is beyond the scope of what we’ve set out to accomplish. There very well may be some loads on the chart below that would be ideal for hunting, but we’ll leave it to others to speculate on that topic. Our 10mm test gun is a Glock 20 Gen 4 with a 4.6-inch barrel. If you’ve seen our other semi-auto caliber tests, you might remember that we used sub-compact pistols with barrels around 3.5 inches while the G20 is a service-size handgun. Why not use a 10mm pistol with a shorter barrel to keep the test protocols more consistent? The main reason is that sub-compact 10mm pistols are just not very common. 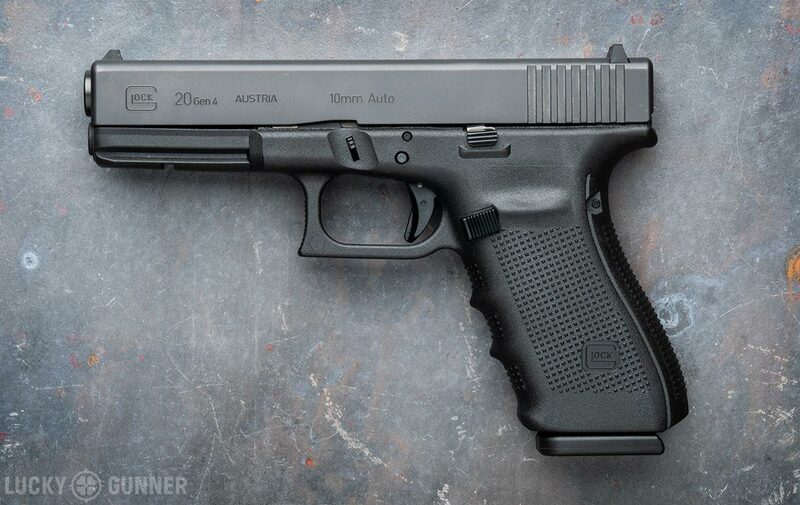 In fact, there are only two models in current production that we’re aware of: the Glock 29 with a 3.8-inch barrel and the EAA Witness Compact with a 3.6-inch barrel. We chose the sub-compacts for the other calibers because we wanted to use the kind of guns that our readers are most likely to carry. But sub-compacts don’t seem to be very popular among 10mm fans, so we went with the full-size G20. The downside of going this route is that our 10mm results are not directly comparable to our other test results. In most cases, the 4.6-inch barrel of the Glock 20 will boost a bullet’s velocity by an extra ~40-90 feet per second compared to a subcompact barrel that’s an inch shorter. So if you want to compare the results from our .380, 9mm, .40 S&W, or .45 ACP tests to the 10mm results below, just keep in mind that the 10mm has an “unfair advantage.” At some point in the future, we may re-test the other calibers using service size pistols and we might even come back around to 10mm and run some short barrel tests, but there are a few other calibers we’d like to test first. In case this is the first of our gel tests you’ve seen, the chart below is more than just a colorful static spreadsheet. Clicking on any of the column headers will sort the chart by the attribute in that column. Clicking on the name of the load will take you to a new page with additional photos, a high-speed video, and the complete test data for that load. You can also click on the graph that shows the penetration depth to get a photo of the actual bullets in the ballistic gel. The thumbnail photos of the expanded bullets can be enlarged by clicking on them. Five of the eleven loads we tested met the FBI criteria for penetration and also exhibited good expansion. Some of these five are loaded fairly light for 10mm and are barely distinguishable from a typical .40 S&W load while others are closer to the original “hot” 10mm loads offered in the early days of the caliber’s history. This is an important reminder that every bullet performs optimally within a specific velocity window that varies depending on its design. Faster is not always better. Two additional loads had excellent expansion but penetrated an inch or two beyond the desired 18-inch maximum depth. Depending on who you ask, slight over-penetration is not always considered a deal-breaker, and these loads might still be worth considering for self-defense use. Two loads penetrated cleanly through two full blocks of gelatin (32 inches) without expanding at all. One of those two, the 180 gr Federal Trophy Bonded, is a soft point bullet designed to expand on impact but it failed to do so, possibly due to the heavy clothing barrier. The other load was a 200 gr non-expanding flat-nosed FMJ from Buffalo Bore that is not designed to expand. We included this load in the test because it was the closest factory offering we could find to the very first 10mm load introduced back in 1983 — a 200 gr flat-nosed FMJ from Norma with an advertised velocity of 1200 fps. The Buffalo Bore load clocked in about 90 fps slower, but still at a higher velocity than what is typical of most heavy commercial 10mm loads produced today.